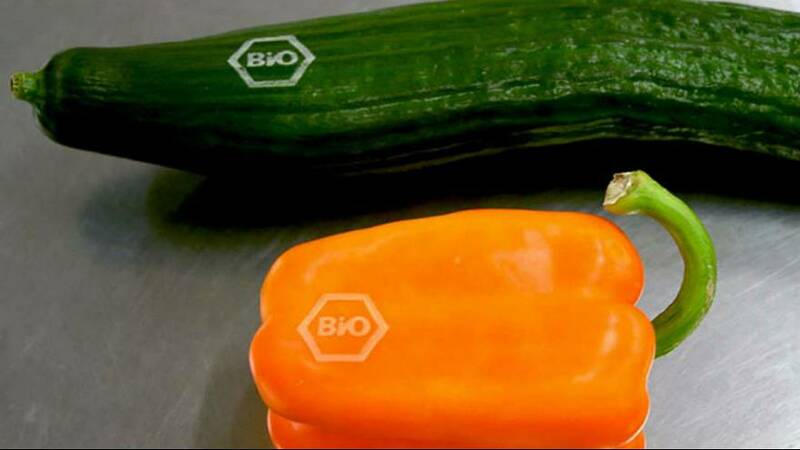 A distributor of fruits and vegetables has found a way to burn ‘organic’ labels onto produce to replace stickers or plastic wrapping. Dutch firm Eosta claim to have saved at least one million product wrappers since the introduction of their high-tech innovation earlier this year. An ‘organic’ label is ‘tattooed’ onto fruits and vegetables by removing pigment from the skin of produce using laser technology. The method dubbed ‘natural branding’ doesn’t affect eating quality or shelf life, according to Eosta. Initially only used on thick-skinned produce like sweet potatoes and avocados, the firm has now managed to laser brand edible skin too. German supermarket REWE is the first to sell ‘tattooed’ cucumbers. The plan is to start labeling other edible skin produce too, starting with apples and pears. “We took a risk, because we didn’t know how consumers would respond to it,” said Michaël Wilde, sustainability and communications manager at Eosta. Since the beginning of this year, demand for Eosta’s ‘laser-branded’ produce in Europe has grown. At least ten supermarket chains – from Austria, Germany, Sweden, Netherlands and Belgium – have been getting their fruits and vegetables branded. Eosta currently has one laser-branding machine, and is about to invest in a second one. Two other machines from the Spanish manufacturer operate from Spain and the UK. The technique was initially developed for marketing purposes, for example to create a promotion image on Easter eggs. It later turned out to be the perfect response to cheeky customers. If you’ve ever tried to buy organic produce for the price of standard fruit and vegetables, you know that it isn’t really that difficult. Take a luxury watermelon, get rid of the sticker, and replace it with the price tag of a standard one before getting to the checkout. When the skin of the watermelon is ‘tattooed’, cheating is no longer possible. However, organic produce is often heavily packaged, as legislation requires, to distinguish organic from standard fruits and vegetables. Laserbranding provides a legal alternative to this packaging. It also enables produce to be sold in bulk, avoiding waste. Together with a Swedish supermarket, Eosta tested whether bulk buying increases sales. Instead of selling oranges in nets, they sold them in bulk with a sticker on each orange. They found that shoppers would buy a lot more produce when it was presented in bulk. Before customers would leave the whole net if one orange was bad. Also, not every customer wants to buy five oranges at the time, so none of them get sold.